Every Summer I try to read some books outside of the education/ed tech genre. 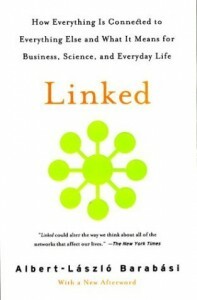 I a quest to find “Reality is Broken” and ended up with “Linked“. Basically it is book that explains how complexity is new challenge of science and that understanding networks will lead to a complete understanding of the natural world. I love the analogy he uses, “Science of today is like a toddler that took something apart, but can’t figure out how to put it back together.” In the after-effects of NCLB, I think that most teacher feel as though learning has been completely deconstructed to its component parts (i.e. standards/Performance Objectives) but just know what those parts are is not enough to put together a compelling or relevant education. We have it wrong, learning is based on the principles of a network but that doesn’t mean you have to be on a network to learn.What I mean is that you don’t need any technology to create a brilliantly networked learning system. In many cases the technology is just smoke and mirrors for poor learning and teaching. But what if we started to think about student learning in a 3D web instead of a linear progression? Everything suggests that this or something even more complex is a more realistic portrayal of our neural networks. If learning is built upon a network model maybe differentiated nodes can explain learning modalities and intelligences.I think that many of the components that have always been there in educational thinking get pulled together when you think of learning as a network system. What if Gardner’s Intelligences represent some of the many pathways for students to engage in content. Maybe learning modalities (i.e. touch, auditory, visual, etc…) are just separate nodes that can all connect to the same content knowledge. What if in some learners the content requires that you go through a visual lesson full of analytical thinking to get to the concept? If you think about the process of learning as the development of a network then many of these things seem to compliment each other better than ever before. If we do have differentiated learning nodes then it should be possible to diagnose a path that could be effective.Much like with medicine, will there come a time when assessments will be able to provide a learner with what is most likely the most effective way for them to learn? I don’t just mean in the traditional since of you are a visual learner so I’ll let you draw your book report. But what if we can define clear pathways for the many hundreds of different ways to learn a concept and proscribe the version that best suits your learning based upon your existing learning network? We need to develop metrics for these things.What type of Star Trek like technologies are we going to need to make this happen? Is that what was already happening on Vulcan in those little learning chambers? Pretty compelling idea to think that in something as complex as learning there is most likely an underlying network that can eventually be decoded and then used to bring us a level of customization and personalization that we have never experienced. The problem with educational consumerism….